Four down, ninety-six to go. A few days ago, while working on my goals for 2018 I decided to set a goal of reading a hundred books in the year. Thinking about it, I decided the only way to pull this off was to read short books. I made a list of 66 short novels and wrote about it. Thinking more about it, I was excited enough to jump the gun and start the 100 books immediately. The first one I read was Shirley Jackson’s We Have Always Lived in the Castle. The second was Zastrozzi, by Percy Bysshe Shelley. The third was The Room by Jonas Karlsson. Next up is a Novella, Snapshot by an author I have never read before (to my memory), Joe Hill. Not sure where I read about Hill, but I did read about him somewhere and he sounded like something I’d like so I put his collection of four Novellas onto my Kindle. And Joe Hill is an author that I’m interested in. You see, I have this odd theory of literature. It’s not the only theory – but it is one that I think about a lot. There is the ordinary life that we all live – but it is a small amount of four-dimensional space in the whole of reality. Beyond this little island of our everyday, comfortable world is the bottomless sea of chaos. There is a thin barrier, a translucent membrane, separating us from this tractless void that surrounds us. Certain fictional people, certain stories, rub up against- or penetrate completely this delicate membrane. Sometimes the characters return, sometimes not. This is what I’m interesting in writing about and reading about. 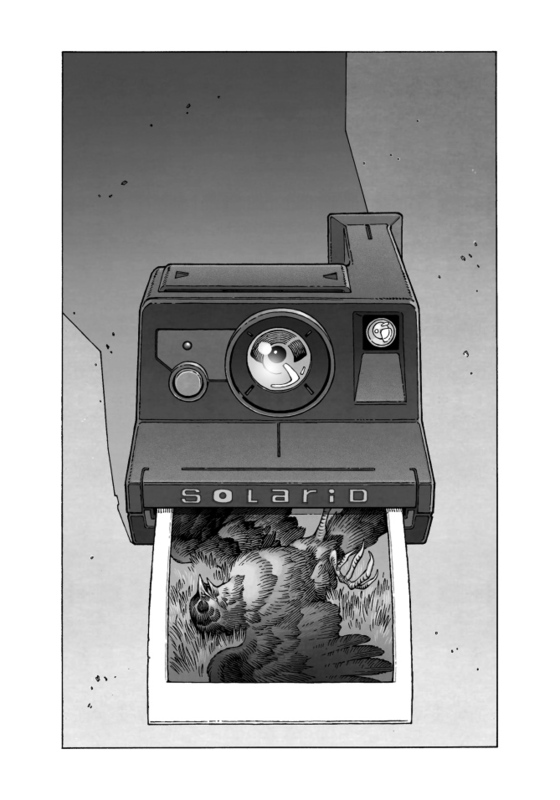 In Snapshot the character is an overweight unpopular teenager and his experience with the void is in defending an addled old woman against a lunatic tattooed man with a very strange and dangerous camera. It is a crackerjack tale. I especially like it because not all wrongs are righted and not all secrets are revealed. Another nice thing is that there are three other novellas in the collection – though they will have to wait for later. This entry was posted in Books and tagged 100books, 2018, 2018 goals, author, camera, horror, joe hill, memory, polaroid, postaday, postaday2017, snapshot, stephen king, strange weather, Writing. Bookmark the permalink. Looks like his father for sure. I like his books also. Yeah, when I was looking for info on him, I kept looking at his photo and thinking, “Why are there all these pictures of Stephen King?” I really didn’t know it was his son until after I had read it. It was interesting – very similar to his father’s work. I like how you know what you want to write and read about! I often find myself all over the place. Although, I’m noticing if I keep writing and reading faithfully, hopefully daily, I see various veins emerge. This is another title and author I’m totally unfamiliar with, thanks for sharing. I have been struggling finding purpose in my reading – I too was all over the place, starting a bunch of books and not finishing – that’s why I set the goal and am tracking what I read. The idea of short books is cool because I can risk reading books I know little about.